In 2013, Chromecast was a revelation. For $35 you could transport virtually anything you could watch on a computer or phone to a television. Easy! Chromecast Audio performs a parallel magic trick for audio and speakers. It’s a similar tech magic trick that’s lost its shock and awe. A little $35 dongle designed to bring music wirelessly to speakers much the same way the original Chromecast brought video to your TV. The updated line of Chromecasts feature a dual-band (2.7 GHz and 5 GHz) wifi, so hopefully your streams won’t cut out as often as with the OG Chromecast. Wireless audio is long, long way from being considered a “new idea.” Bluetooth audio has been relatively reliable for some time now, and it’s built into legions of standalone speakers, much like the wonderful Boom series from Ultimate Ears. There are also a number of little adapters that bestow Bluetooth powers upon older products. And for people willing to spend more money, there’s a new wonderful world of wifi audio like Sonos and others of their ilk. Now, Chromecast Audio’s nuzzling its way into your life somewhere between all those existing options. 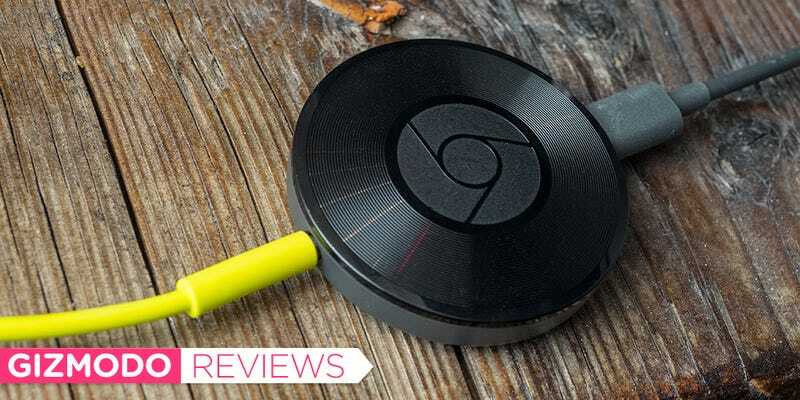 If you’re already relying on a Bluetooth arrangement, you don’t really need Chromecast Audio. This is for people who have some kind of speaker system—a dock, or computer speakers, or maybe even a fancy component hifi system—and want transform it into something that can play audio wirelessly. A little 1-inch plastic puck with a USB-connection on one end and a 1/8-inch audio jack on the other. USB goes to the required wall power and the audio winds up in the aux input on your (probably old) sound system. This device is not good looking. In fact, it’s kind of cheap. Hopefully you can hide it, where ever this ends up in your home. After connecting it to power and the speaker of your choice, an iOS or Android companion app will guide you through configuring the Chromecast to your wifi network. There’s also a desktop utility for setting up your Chromecast. It’s full of much hand-holding and is incredibly straightforward. Chromecast Audio allows you to stream from basically any audio app you can think of. In the event that you can’t, you can just broadcast any sound that’s playing in a Chrome tab on your computer to Chromecast Audio. Does it work? Mostly. Although, I encountered the same connectivity problems I that plagued the original, video-based Chromecast—despite the new dual-band wifi. When playing from apps on the new Moto X Pure Edition or iPhone 6s Plus I had virtually no issues. I did have a rough experience casting audio from my Chrome tabs on two different Windows laptops. Nothing like choppy audio to make me want to return to an archaic-but-dependable wired existence. That said, for the most part, Chromecast Audio works as advertised. It’s a cheap way to make your existing sound system go wireless. Casting from Chrome tabs on a computer yields spotty results, but if you live a predominant smartphone existence, you shouldn’t run into too many issues. I suppose, if you don’t have any way of wirelessly playing music already. Or maybe you have a big component audio system you haven’t otherwise enabled with wireless powers. Why not. Chromecast Audio only costs $35, and it mostly works. That price is hard to argue with. Think of it as trial of wireless audio. If you end up stoked on blasting sounds through the air, you can always upgrade to a fancier wireless rig in the future.